Solvent distillation unit / vacuum - SDS-101 - Horizon Technology, Inc. Environment - Health - Safety > Waste Treatment > Solvent distillation unit > Horizon Technology, Inc. The SDS-101 Solvent Drying System simplifies and speeds up the solvent drying step in sample preparation. The system consists of the DryDisk® Separation Membrane, PTFE Membrane Holder Assembly, precision controlled Vacuum Regulator, and Docking Bracket Assembly. The SDS-101 is adaptable to common 1/2 in. 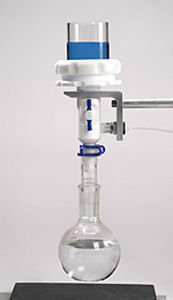 diameter laboratory frames and can be mounted easily under the separatory funnel to collect the solvent extract. Quick disconnect fittings and detachable disk holders permits the collected residual water to be poured back into the separatory funnel for re-extraction and optimal recovery of analytes.